Bosnia, short for the regions of Bosnia and Herzegovina, is the heart shaped land that lies in the heart of southeast Europe. It is here that eastern and western civilizations came together, sometimes clashing, but more often enriching and fortifying each other throughout her lengthy and intriguing history. Bosnia is part of the Balkan Peninsula and gets her name from a river which flows through the country, called the Bosna River. Herzegovina is said to be named from the word “herceg,” a designation for the duke who ruled the southern part of the region prior to the invasion of the Ottoman Empire in the 15th century. She has many neighbors: Slovenia, Croatia, Serbia and Montenegro as well as a sliver of coastline on the Adriatic Sea. Bosnia has three main groups of people as her citizens, Bosniaks, Serbs and Croats, each with their own official language. Prior to the unspeakable war that broke out in the early 1990s, after the break-up of the former Yugoslavia, many areas of the county had mixed populations. Today, it is extremely divided. Bosniak replaced Muslim as an ethnic term to avoid confusion with the religion called Muslim. The religious mix there is 40% Muslim, 31% Orthodox, 15% Roman Catholic and 14% other. Over time, Bosnia has been taken over by many empires; the Romans, way back in 168 BC, the Hungarian Empire, in the 1300s and then the Ottoman Empire, for the next nearly 500 years. During the Ottoman reign, Bosnians adopted varous elements of Turkish culture and many converted from Catholicism and Christianity to Islam. It was in the 19th century, as the Ottoman Empire was crumbling, that Bosnians joined the Slavs from Serbia and Croatia in an uprising against the Turks. As this was occurring, they were getting help from Austria-Hungary with the aid of Russia, which later became part of the Kingdom of Yugoslavia. Soon after, the Nazis moved in. So basically, one ruler after another, took control of Bosnia and her people. She finally gained independence from Yugoslavia on March 1, 1992. The break-up of Yugoslavia was the beginning of the Bosnian war that occurred from March 1992 to November 1995. The atrocities and devastation that happened during that war has left the country divided and still struggling to heal from those wounds. Bosnia, thankfully, has once again become an intriguing tourist destination, one of the fastest growing in all of Europe. What is for certain is that the people, called Bosnians, are hospitable and kind. All the Balkan states have a sort of a creed for hospitality and Bosnians are no exception. If you were to visit there today, a Bosnian would most likely invite you into their home for coffee and baklava. I suppose after such suffering, the simple things in life become the most important. Bosnians, get that concept more than most. Bosnia has a lot to offer. It is a most beautiful country, with some of the oldest forests in all of Europe. Her lakes and rivers are stunningly blue and pristine and she has amazing ski areas to play on in the winter. Sarajevo was in fact the host city for the 1984 Winter Olympics. She also hosts many festivals. One of the most popular, in the summer months, is Bascarsija Nights. Sarajevo`s old Turkish quarter becomes a most delightful place to be. Throughout the month of July, ‘Bascarsija Nights` offers a full program of folk dancing, opera, ballet, rock, love songs and poetry. The cuisine of Bosnia is influenced by Turkish, Middle Eastern and other Mediterranean countries, as well as Austria and Hungary. Typical ingredients include: tomatoes, potatoes, onions, garlic, bell peppers, cucumbers, cabbage, spinach and beans. Although they use many spices in their cuisine, it is usually in a modest amount, allowing the natural flavors of the ingredients to shine through. One of their favorite spices is paprika. They also use a spice blend called Vegeta quite often. Vegeta is a condiment which is a mixture of spices and various dehydrated vegetables, invented in 1959 by a Croatian scientist Zlata Bartl, and has become a product sold worldwide. For meat, they primarily eat beef and lamb. Theirs’ is a hearty diet; with meat found stuffed in almost everything. They also love their rakija; a strong fruit brandy, made of plum or apple, which is popular in all of the Eastern European countries. 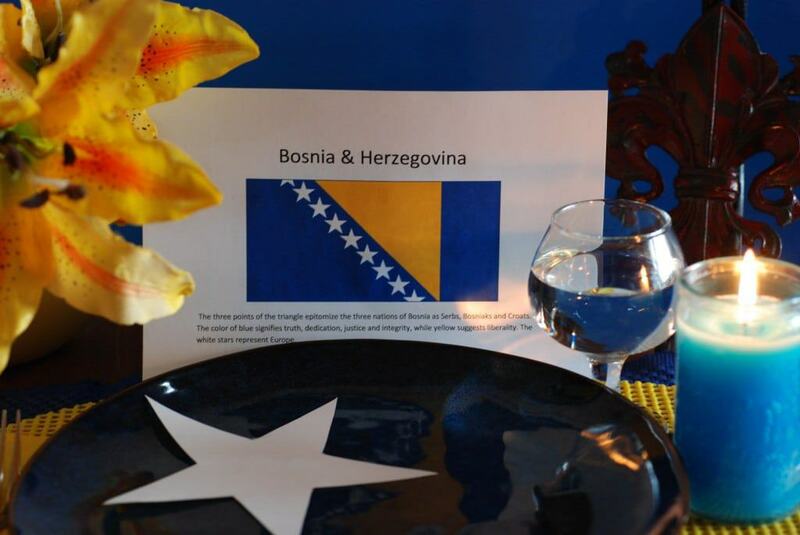 We set the table with the colors of the Bosnian flag; blue and yellow. We decorated with the golden lily, the national flower. We, of course ate continental style, as would be customary there. We began the meal with a Bosnian toast “Živjeli,” pronounced Zhee-vi-lee, which basically means “cheers” in Bosnian. For this meal we toasted with coffee, which is called kafe and trust me, they take their kafe very seriously there. They prepare it with a special copper-plated pot with a long neck, called a džezva, similar to the way Turks serve their coffee but made just a little differently. 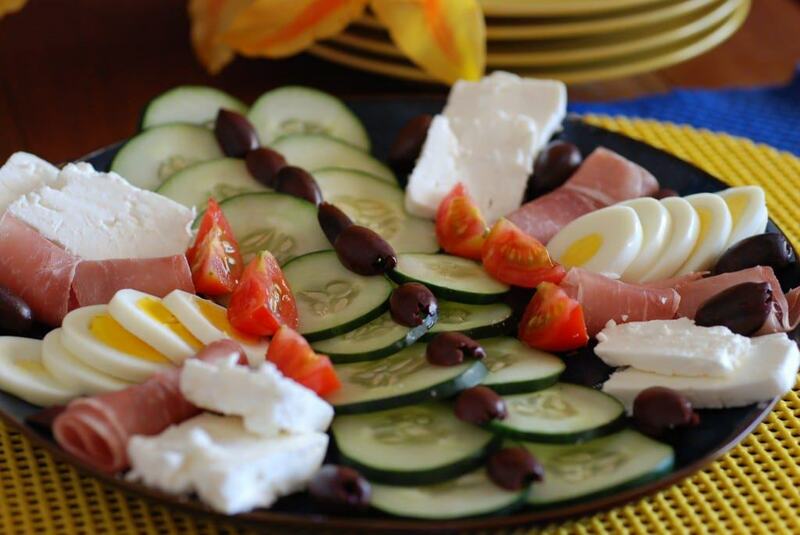 For our appetizer, we had a lovely assortment of items; sliced cucumbers, tomatoes, olives, feta cheese and prosciutto along with hard-boiled eggs. The combination of components, called Meza, was delicious and a great way to start our meal. For the main course we dined on delicious stuffed bell peppers. 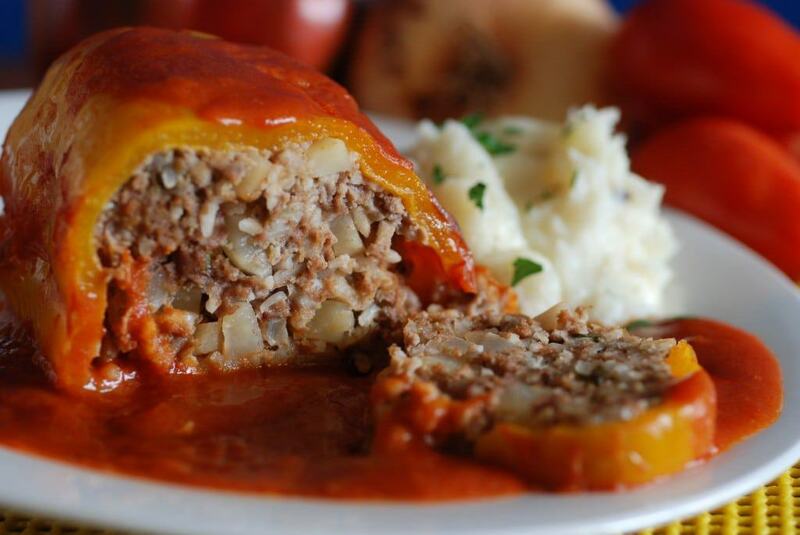 They were stuffed with minced meat, cooked in a tomato broth and flavored with paprika. With the peppers, we served a simple, mashed potato side and we loved it. The dinner was quite filling, so we had left overs which we enjoyed the next day for lunch. For dessert, we presented poached apples. They were served cold, having soaked in a sugary sauce then topped with whipped cream. 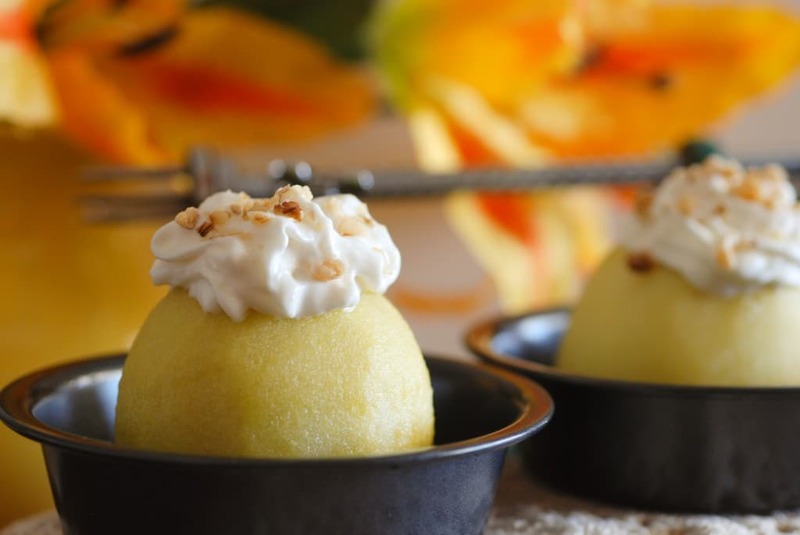 The crunchy filling of the walnuts added a lovely nutty flavor and nice texture to the sweet apples. The dessert went especially well with the Bosnian kafe. As we say goodbye to Bosnia and Herzegovina we leave with hope and peace for this little country still trying to find her way. This is what historian Enver Imamaovic wrote. “Despite the fact of war, the lilies’ roots have not been killed, a long time symbol of the Bosnian people. One day from those roots, the slender, golden lilies will blossom again and cover the whole of Bosnia.” This is our hope, for a peaceful, beautiful and ever blossoming Bosnia.